During the month of September we had the grace to attend the 9th European Catholic Colloquium in Warsaw Poland. It was sponsored by China Zentrum (中國中心) of Germany. Many Clergy, Religious and Laity from all over Europe and China were in attendance. We had the opportunity to meet Archbishop Savio Hon, Secretary of the Congregation for the Evangelization of Peoples. We shared with him the charism of our ministry and also showed him our teaching and evangelization materials. During the four days, we distributed hundreds of Chinese Martyr Saint Holy Cards to the participants. We met newly ordained Father Jan Stanislaw Hou who is very interested in starting an evangelization group in Warsaw. We also met pastors of the Chinese communities in Germany and Belgium. It was a wonderful opportunity to be able to meet them and discuss ways in which we could work together to bring the Catholic Faith to the Chinese living in their communities. China Zentrum organized a pilgrimage to the church and grave of a very courageous priest, Blessed Father Jerzy Popieluszko. You can read about him below. We also went to Krakow to visit a Basilica built in honor of St. John Paul II. 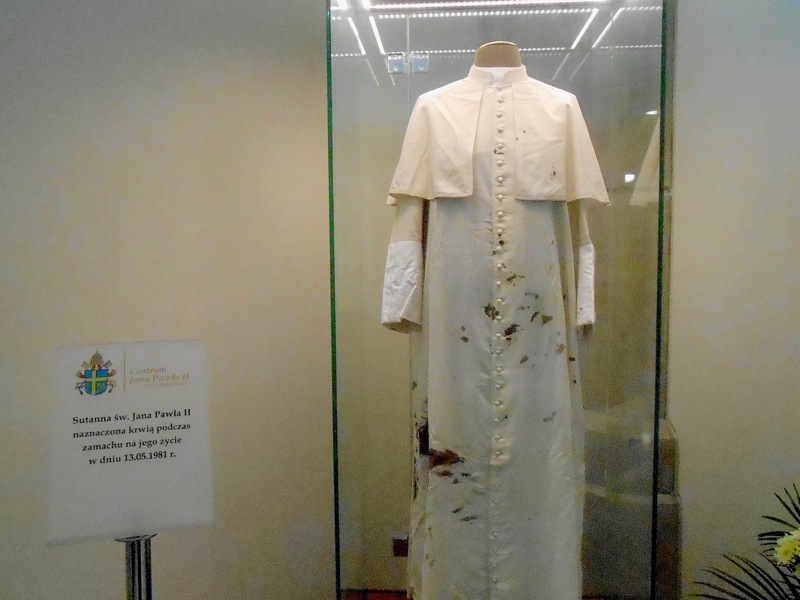 On display was his cassock that he was wearing at the time of his attempted assassination. Also there was a vial of his blood (first class relic) which is placed under the altar. While in Krakow, we visited the convent of St. Faustina and stood in the place where Jesus appeared to her. Our time in Poland was very special. The people of Poland are very serious about their faith. It shows by the great numbers of people attending mass and also the number of pilgrims visiting these holy places.